Full Double; large, opens light pink, the flower form holds well as it ages. Flowering observed a few days before ‘Red Charm’. The blossoms are displayed on sturdy, erect stems a few inches above the compact bush, side buds absent, upright stems. Bush largely unaffected by stormy weather while in flower. Deep green foliage holds condition well into summer, some resistance to leaf fungi, very little susceptibility to peony mildew. Named for one of originator’s granddaughters. Herbaceous Hybrid. Parentage: unknown.�Pollen borne on a thin ring of stamens around the inner flower and a small tuft at center.� Carpels largely absent or abortive, will produce a few seeds when rare normal carpels are pollinated. 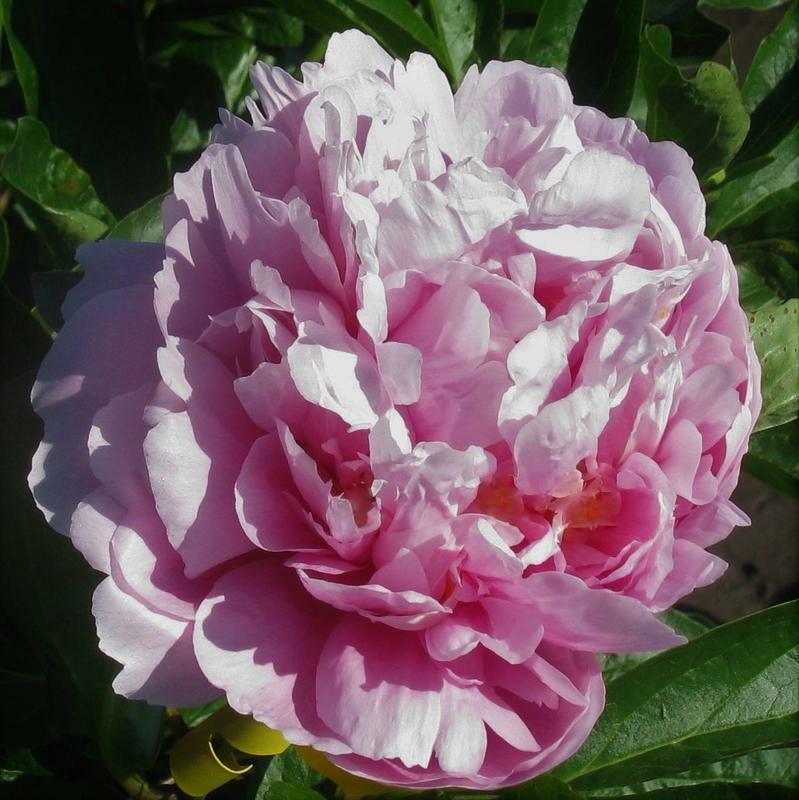 Gena Marie [Herbaceous Hybrid] (Donald Hollingsworth 2019) A Full Double (flower-in-flower form) of light pink hue, the presentation largely unaffected by stormy weather while in flower, quite suitable for a viewed landscape setting without mechanical support; the flower form holds well as it ages.� Deep green foliage holds condition well into summer, although has some susceptibility to leaf fungi, it is generally resistant to peony mildew under field conditions (we do not spray fungicides).� This peony is fertile for breeding; pollen is borne on a thin ring of stamens at inner margin of the lower flower, sometimes on a small tuft of stamens at the center.� Carpels are usually absent or abortive, but the infrequent normal carpels have produced seeds when pollinated.� The name honors originator's granddaughter, Gena Marie.